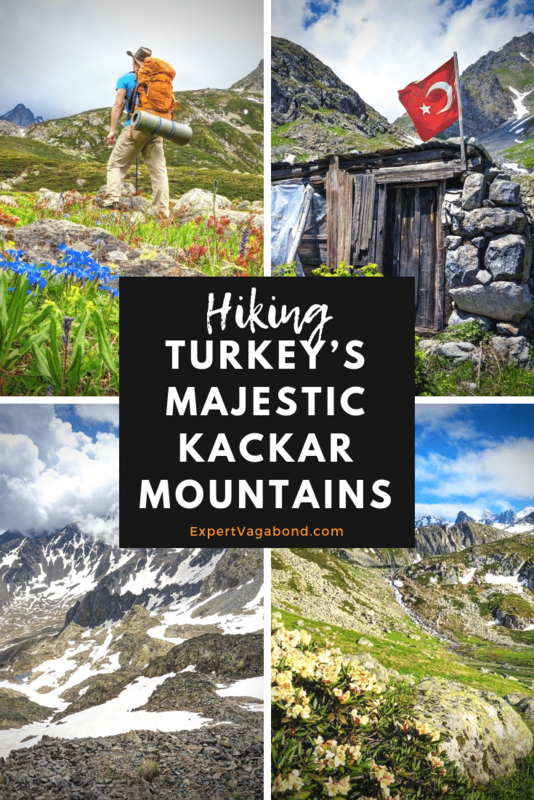 Join me for an epic trekking adventure into the beautiful Kackar Mountains in Eastern Turkey where raw wilderness and ancient lifestyles leave lasting memories. 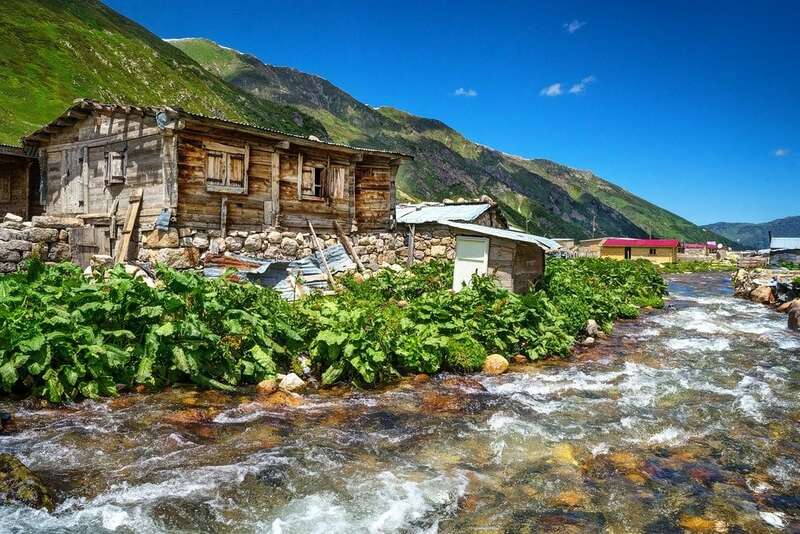 I began my Kackar mountain journey walking up a dirt road towards lush green foothills from the small tourist town of Ayder. Passing the occasional deserted yayla next to a river swollen with fresh snow-melt. 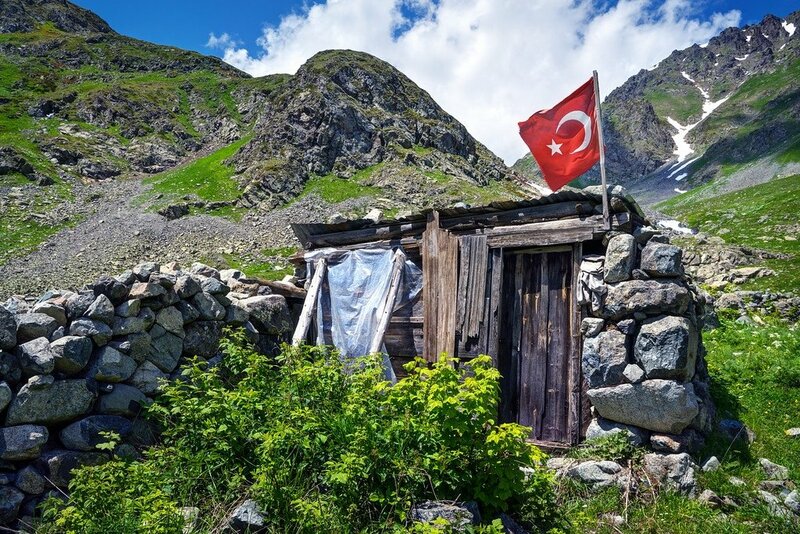 Yaylas are small Turkish mountain villages inhabited by nomadic herders who bring livestock here to graze high pastures in spring & summer months. Many were abandoned, a few showed signs of life as locals began returning with their animals. In one such village, called Yukari Kavrun, I was startled to find a large angry bull blocking the road. I cautiously backed away until the snorting animal decided to harass a group of cows nearby while locals yelled and chased it down with ropes. The people who live in these valleys come from all over. Their ancestors were originally from Armenia, Greece, Georgia, Russia, even Uzbekistan. They make a living herding cows and sheep; producing delicious cheese, yogurt, and the best honey in the world. Climbing a steep trail above the village, I stopped briefly for lunch on a hill surrounded by colorful orange, yellow, and purple wildflowers. 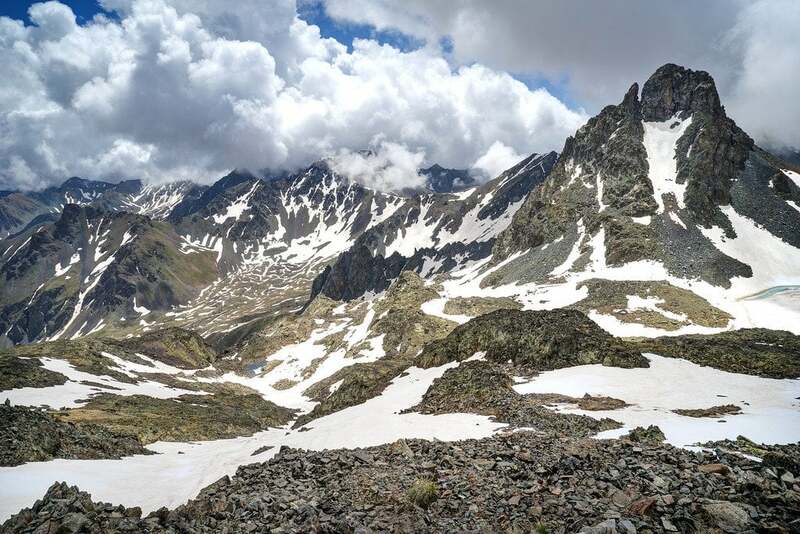 A jagged wall of snow-capped peaks loomed ahead as I hiked on. Weather changes quickly in the Kackar Mountains. Bright blue sky was consumed by a blanket of dark clouds rumbling with lightning and thunder. Then came the hail! I was forced to retreat into a valley to find cover as lightning repeatedly struck the exposed ridge in front of me, hastily constructing an emergency shelter using a rain tarp and crawling under just as the worst weather hit. CRACK! BOOOOOM! It was the loudest thunder I’ve experienced, practically shaking the mountain beneath me. Soon followed by blinding flashes of lightning. I love crazy weather, but this was pretty scary. Hail hammered down from the heavens — closer than usual here at 8,000 feet. The bad weather passed almost as quickly as it arrived though. I emerged from my shelter to begin hiking again, searching for a decent camping spot. 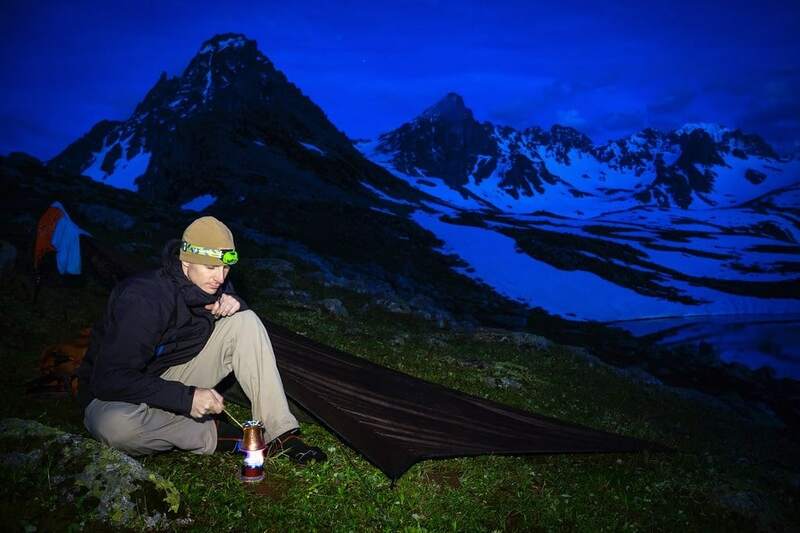 Stopping to set up camp and prepare hot tea beside a deep blue alpine pond as the sun dropped below the horizon. What kind of shelter was I packing? A hammock of course! But at these altitudes there are no trees… only rocks. However you’d be surprised at just how versatile a camping hammock can be. 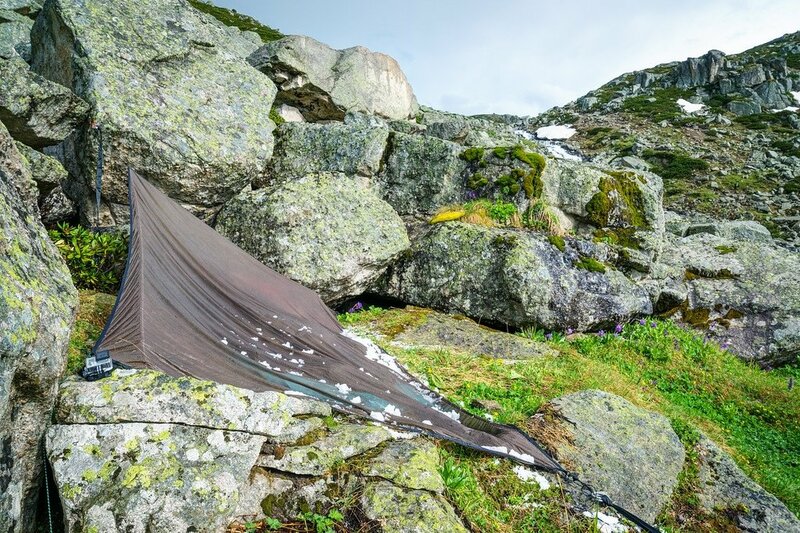 A set of rock climbing nuts, a large trash bag, and a foam pad turns a hammock into a traditional bivy sack for sleeping on the ground. The temperature dropped and I gazed at the stars in total silence for a while, drinking some olive oil and doing pushups to build up some body heat before climbing into my sleeping bag for the night. The next morning was cold and sunny. I scarfed down some bread, honey, and trail mix for breakfast before heading back out on the trail. Walking down into a valley through snow towards another mountain lake. The sunlight didn’t last long though, and dark clouds soon moved in for a 2nd day, threatening to delay me again. I managed to hike up and over the pass after taking shelter under a rock for an hour as another hail & lightning storm floated by. The trail here is almost completely hidden from view under a layer of snow, which usually sticks around until mid July in the Kackar Mountains. There were a few tricky sections where the snow was deep, but I made it down into the next valley after about 6 hours of hiking — and what a beautiful place it was! The area is called Dupeduzu, a popular camping spot in these mountains. 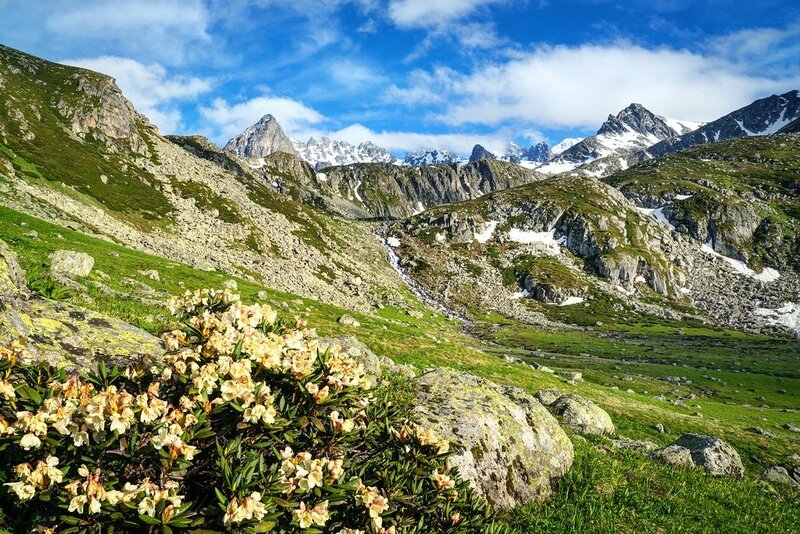 Fields of blinding white snow morphed into lush green grass covered with vibrant wildflowers. The soundtrack to this paradise? Gushing rivers winding down from the steep mountains above. After camping out for a 3rd day in the mountains, I hiked down to lower altitudes in order to stock up on food. Luckily there are many yaylas not far away where it’s possible to buy basic supplies like bread, cheese, trail mix, canned tuna, olives, and beans. Because it was still early in the season, some villages are sparsely populated or completely abandoned. It took me a few hours to reach one of the larger villages called Olgunlar. They have a few small guesthouses here, and an early morning dolmusch (public taxi) that will take you out of the mountains on a dirt road. 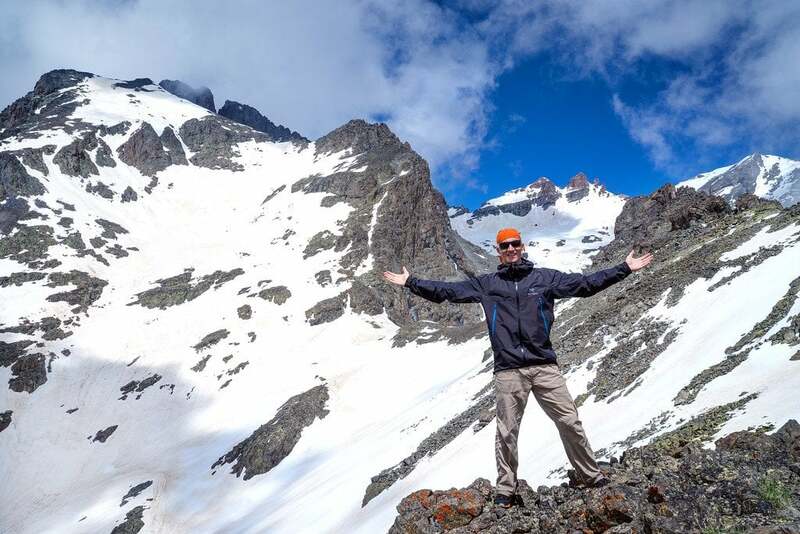 Once stocked up for another 2 days of trekking, I left Olgunlar on foot to begin climbing towards my ultimate goal, a stunning high mountain lake called Deniz Golu, and maybe a summit attempt on Mount Kackar itself, depending on hiking conditions. 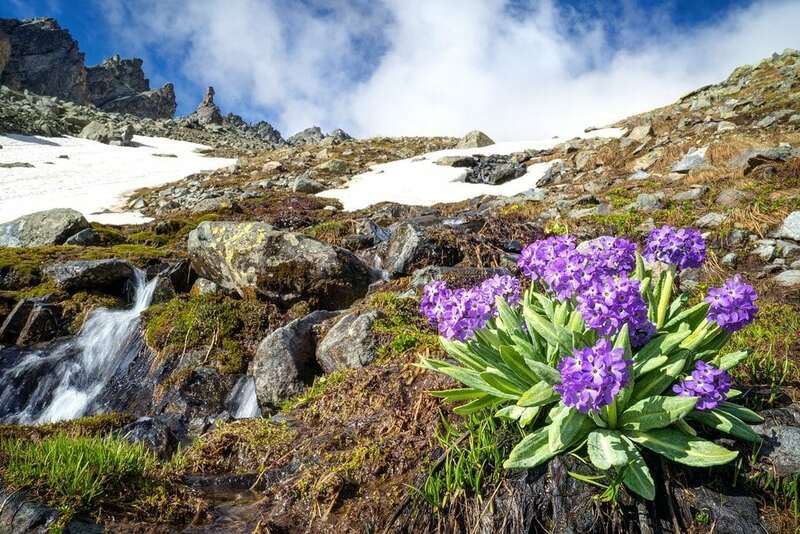 The Kackar Mountains have an incredible amount of diversity when it comes to wildflowers! 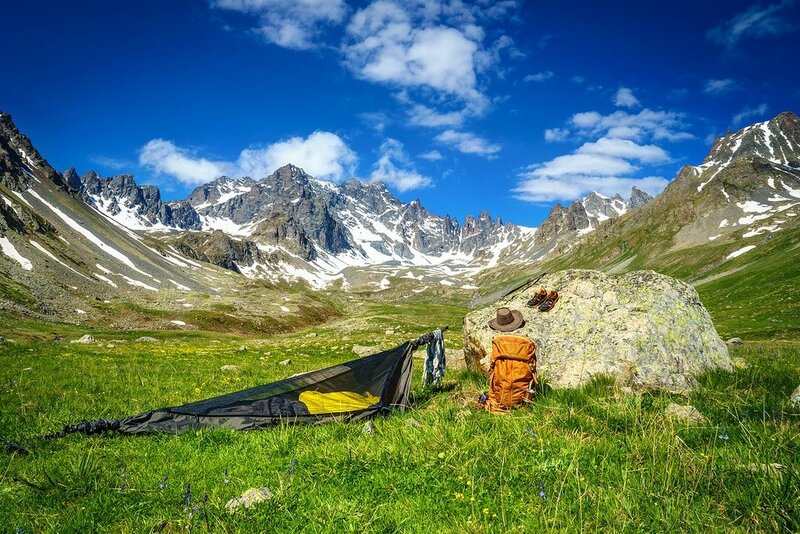 I pitched my hammock/bivy beside a large boulder at the Dilberduzu camping area, where there’s actually an outhouse due to the large number of local hikers who pass through for summer mountaineering adventures. I finally ran into a few other hikers here too. On the morning of my 4th day I rose with the sun to climb as high as I could into the Kackar Mountains. It didn’t take long to reach snow, and a majority of my hike was spent in it. Not fully equipped to trek in these conditions, I was using small garbage bags to line the inside of my shoes — a type of poor-man’s GoreTex. While your footwear gets soaked on the outside, your feet themselves stay pretty dry. Most of the snow was well compacted by this point anyway, so I only sank down to my ankles. The effects of altitude hiking at 10,000 feet was taking its toll — catching my breath was a bit more difficult and slowing me down. But after about 2-3 hours of scrambling up over rocks, I made it to lake Deniz Golu, which unfortunately was still frozen over! Too bad, as I’d previously seen photos of the lake, and it’s a spectacular shade of blue. I hiked further up to 11,000 feet searching for a high vantage point for capturing photos of the amazing landscape around me. Mount Kackar itself was covered in a thick layer of clouds & fog, and with no discernible trail in the snow, it wasn’t safe for me to continue on my own. Especially without proper gear. Once I had the shots I was looking for, it was time to make my way down these mountains and back to civilization. What is the quickest way to descend a snow-covered mountain? 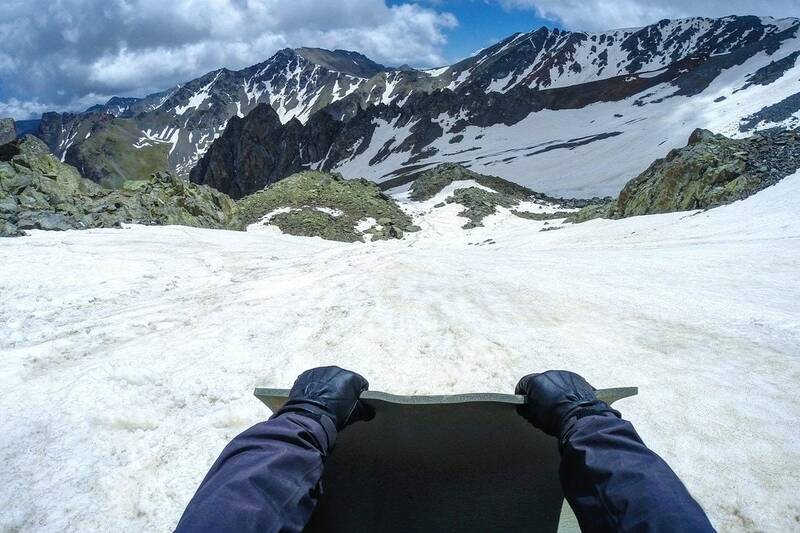 Extreme sledding of course! 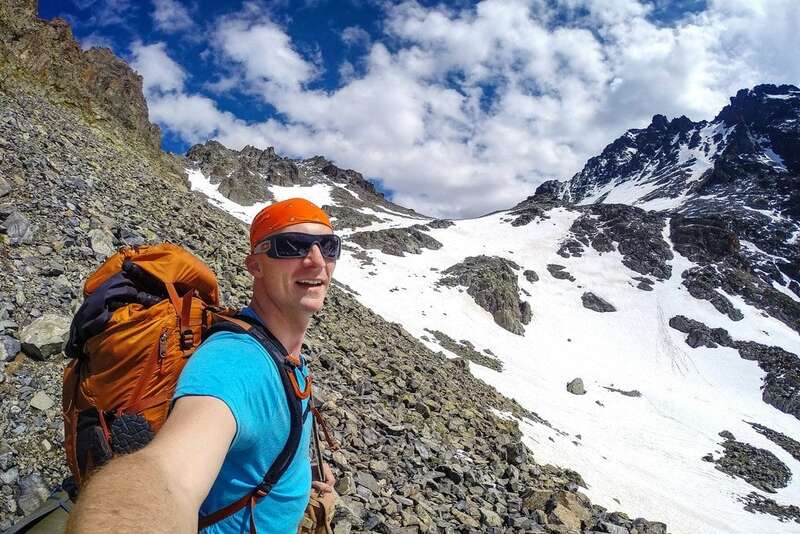 Do you have a favorite trekking experience somewhere? Any questions about Turkey? Drop me a message in the comments below! As a native of that mountains, welcome to our homeland. If you wanted to pass through Kackar mountains(TransKackar) you should start from Yusufeli which stands another side of Kackars. TransKackar can be made with basic equipments. 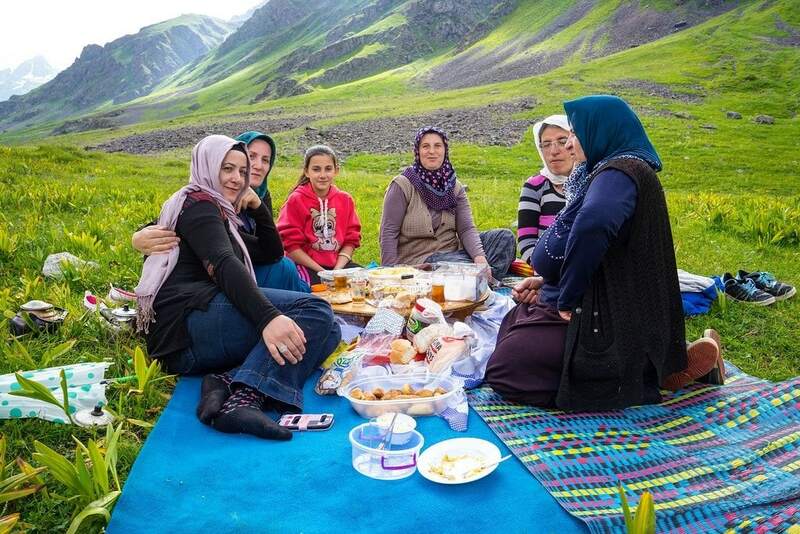 In Kackar mountains, there is so many “yayla”. If you come around here again, please send an e-mail to me. I will be happy to help you with places that you should see. I’m heading to Turkey sometime in the next few months, on my way from Europe to Asia. What time of year were you in the Kackar mountains? When is the earliest you think it’s smart to go (obviously each year will vary, but roughly)? I have been there in the first of September, not in the mountain, but next to it in a small village called kavrun. The weather was so nice and the people were so friendly. The village was so quit and neat, extremely advisable for relaxation and recreation. Definitely I will visit this place again. Dear Matt, welcome to our country, you have amazing photos and videos I love that. Next time you should come western-blacksea cost where I’m living and working for eco-tourism near Kure Mountains places Amasra – Bartın city. Beautiful photos and video Matthew. It’s a part of the world I’d love to see more of. Well done. What an incredible mountain peaks, It looks like the peaks almost toughest the sky. Your photos are beautiful, It gives me the nerve to pack my things and go there as well. I wish I can also visit the mountain and experience mountaineering adventure. Great Photos of this wonderful wilderness. I was there this past June, based in Barhal, and drove to Yayalalar and walked to Olgunlar and around the flower- covered meadows. 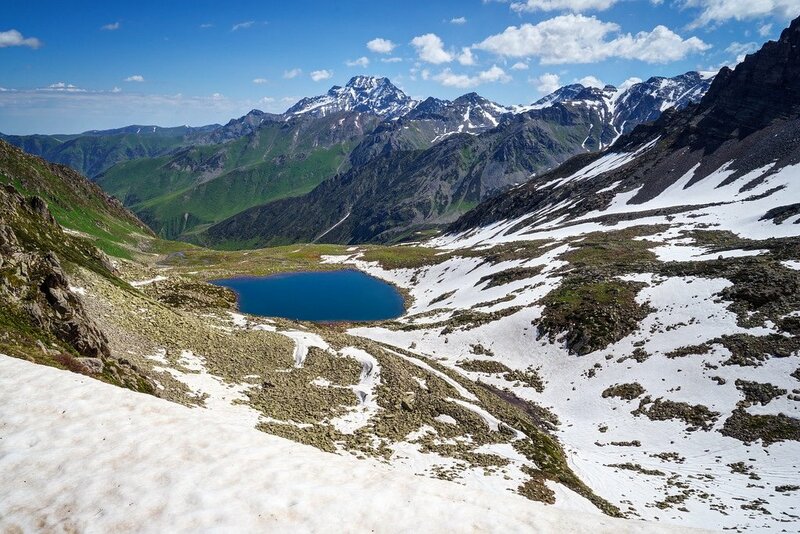 We also used a local guide to take us up to Libler Gölü – a stıll frozen lake in late June – that was a magnificent five hour walk from Kurdat where had camped overnight by a rushing stream. The views were fabulous views, were the only ones there, the flowers amazing and had great fun crossing powerful streams as well as snow fileds and screes to traverse. 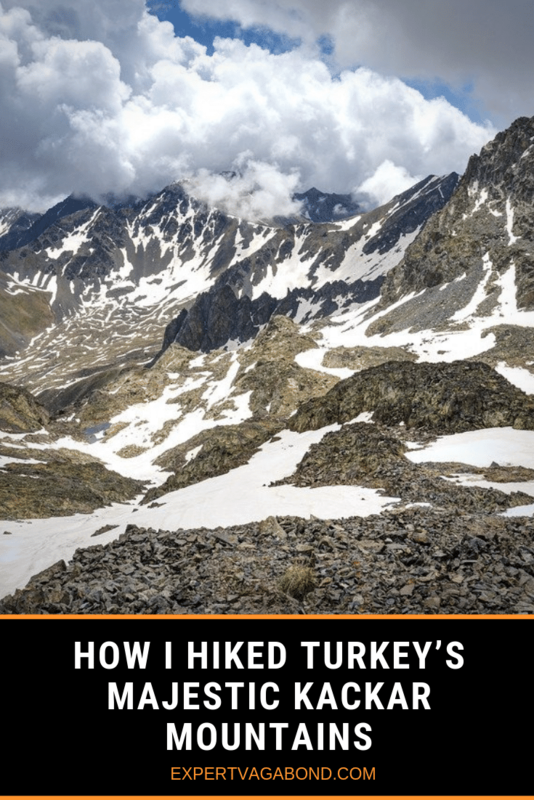 This was the best walking holiday I have done and am planning a return trip next year to include walking up to mount Kaçkar and to enjoy the hospitality of the very reasonable pension we stayed in that provided masses of tasty food and drink. çok güzel! I’ve been to Turkey twice, but never out east. One day (sooner rather than later) I’ll definitely have to make the trip out there. This is nearby my city Trabzon. however i never been there because of i am living abroad. Welcome to our country brother. Thanks Metin! You have a beautiful country here. What a beautiful place and your photos are great! Turkey has always fascinated me. Never really considered it as a camping destination but you have changed my mind. I had no idea that Turkey has such landscape and mountainous terrain! Great post, Matt, and lovely pictures of the locals. Breath-taking views in beautiful photos. I am really feeling the desktop traveling experience. Glad you enjoyed the virtual backcountry hiking Brittney. The photos really don’t do the area justice though, you should visit yourself one day! A side of Turkey I never thought existed. Simply breathtaking views, man! I didn’t know Turkey had this kind of scenery either, stumbled upon some photos online that convinced me to take a look in person. Glad I did. Man, I just LOVE your photos. Wow – you really went far up. I made it to Demirkapi and that was it. Well done to you. Nice to read a different topic about the country. Thanks Natalie. I need to return soon, I’ve been inspired to see more of the country lately because of your blog. Do you use the trash bag as a tarp, or for something far more creative that I’m not thinking of?? Gorgeous photos! Yes, as a simple ground tarp to stay dry. The hammock actually comes with a rain tarp. What an absolutely positively stunning collection of images. Fab experience, and that thunderstorm must have been something else too. Between the high altitudes, different air masses, valleys and the overall clime of the regions monstrous, severe storms can pop up and beiege you within minutes. So glad you found some make-shift shelter. I like you love crazy weather, but I know when it feels kinda scary too. Even though I’m a meteorologist – by dgree, pro blogger by trade – I care not to get caught up in some crazy situations like you experienced. 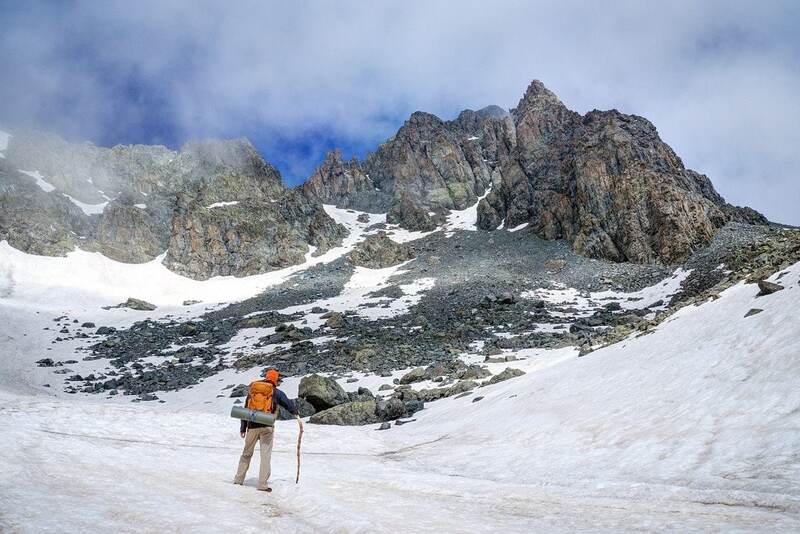 The often-changing weather made the hike a bit more challenging, but who doesn’t enjoy a good challenge? Absolutely stunning photos and great video. 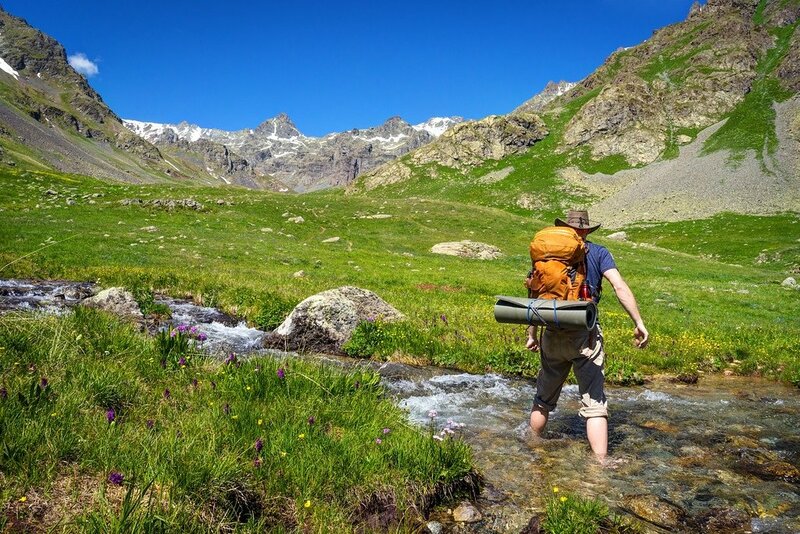 Did you end up hiking with all of your normal kit? Computer, full dslr gear, etc? Or did you find somewhere to stash it before the trip? I’d be worried about slipping and falling in snow or one of those mountain streams. Great question! No, I left my daypack filled with stuff I didn’t need at the first guesthouse I slept at before the hike. My computer, extra clothes, etc. Took a shared taxi back after to pick them up. Most places will let you store some luggage if you ask nicely. Lucky for us the cows didn’t get you. I’m definitely going to add this to my list of places to go see. Do you know when in the year is best to see the lake defrosted? Locals told me it would thaw out in a week or two. So the first week of July would probably be best, however you’ll have a few more people on the trails. Mid July & August are the high season for the area. I was here late June. wow what a stunning feature image (well all of them are!) wildflowers are kind of my obsession- I bookmarked this post just to come back and look at these pics! thank you for sharing this great story. Many different colors of flowers up there Rachel. It was impressive to see — and also the reason why their honey is so good. Beautiful video and photos! It reminds me of trekking the Stans. I guess I need to explore more of Turkey! As do I… it’s a huge country. What time of year is it and what do they use for heat? I’ve noticed you seem to wrangle eating, drinking and general fraternization with the women of these countries. Too much adventure for me. The place looks great, untamed and unspoiled. I’m sending a fast food rep. and a big box store rep. there next week; they’ll love it. This was late June. The nights were chilly but it was about 60 degrees during the day. The larger villages have power & natural gas tanks, my guess is animal manure is used in the tiny ones — but they aren’t inhabited during the winter. WOW! Fabulous video, Matt. Loved the narration and the fact that we got a glimpse into exactly the kinds of things that you do along the way. I may be biased, but…I think that it is BY FAR your best video to date!! Don’t know how you dare to hike all by yourself, though, and how you wade thru FREEZING waters BAREFOOT! Glad you liked it! I’m very aware of my limits, and try to stay as safe as possible. 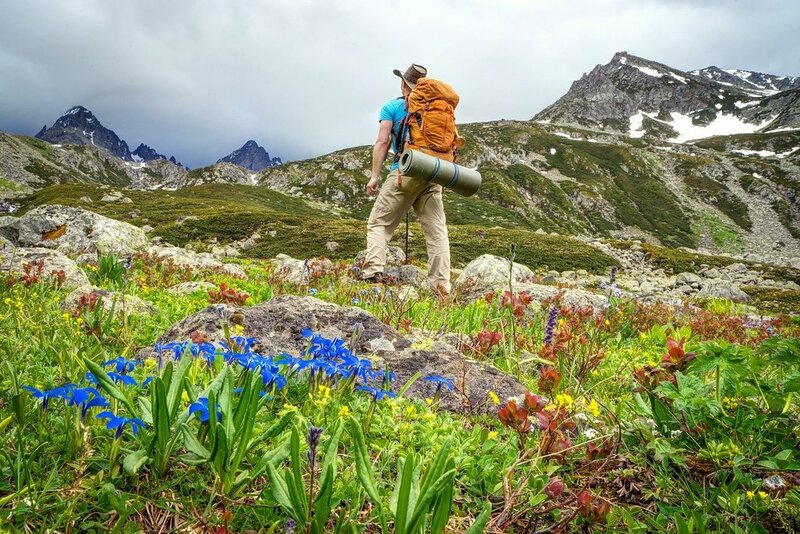 Challenging yourself to a solo adventure like this is always rewarding — and a much different experience than hiking in a group.